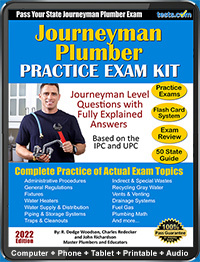 Find journeyman plumbing exam resources such as plumbing practice tests, plumbing test preparation guides and more. 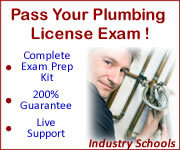 Plumbers are required to take an exam in certain states for licensure. See our sample journeyman plumbing test questions and test tips below. 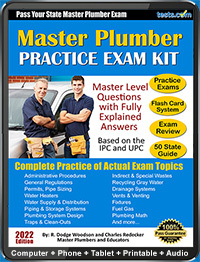 (800) 456-2150	 Pass Your Plumbing Contractors License Exam! Complete Plumbers Licensing Exam Prep KIT with 200% Gaurantee. Description: The Maine Office of Licensing and Registration is an umbrella agency housing professional licensing boards, commissions and registrations without boards. OLR is dedicated to public protection through licensure, inspection, enforcement/complaint resolution, an d discipline. When you sit for the Journeyman Plumbing Exam it is a huge step in your financial future. Those of you who are testing for a journeyman license will find the world opens up to you for job opportunities. The income will be unlike anything you experienced during your apprentice period. Individuals taking an exam to earn a master plumber license are jumping to the top of the heap. If they pass, they have a world of opportunities in front of them. Of course, every master plumber has to get past the journeyman level to achieve the ultimate goal. Apprentices seem to have it made. They can be licensed immediately. All they have to do is work under the direct supervision of a licensed plumber or attend a suitable vocational school. In some cases they do both. But any plumber in the trade knows that the money kicks in with a journeyman license. As a journeyman plumber, you do not have to worry about piping designs and sizing. That is left to the master plumbers. The vast majority of plumbers in the business hold a journeyman license. This license allows them to work with indirect supervision. That makes a journeyman more valuable to an employer. Try to obtain a plumbing apprenticeship. Get as much experience as you are able to do in your state and/or attend a trade school and get your degree in the plumbing trade. Get information from your state or local government about the requirements for taking the journeyman exam. Study with a friend and ask each other questions using a practice test or flashcards. Review the local plumbing code book. Take the day off from studying the day before the exam and get plenty of sleep the night before the plumbing exam. Understand what you can and cannot take with you into the test. Some exams are open code book. Arrive at the plumbing exam center early. 1) Assume that you are installing a tub waste and overflow. It is a brass device that will be connected with slip nuts and washers. You know how to install the waste and overflow on the bathing unit in a way that it is designed to be installed. Which of the following are you also required to know? A) A waste-and-overflow installation that is connected with slip nuts is required to be accessible. B) All waste-and-overflow connections require access panels. C) A waste-and-overflow assembly must be readily accessible. D) Tub wastes and overflows are not allowed to be connected with nylon washers under the slip nuts. 2) The minimum diameter of a drain for a lavatory is ______. 3) Assume that you have several jobs scheduled for next week. Some of them require the replacement of existing fixtures. In all cases the new fixtures will be installed in the same location of the fixture being replaced. Which of the following will require the issuance of a plumbing permit and a code inspection? 4) When is a relief vent required? 5) Gray water can be collected from _______ to be used as recycled gray water for special uses. 6) When a drain-waste-and-vent (DWV) system is a new installation, and being tested, the test must be maintained for a minimum of ________ minutes. 7) An air gap is the most positive type of protection against backflow. 8) The only fixtures allowed to be fitted with island vents are sinks and lavatories. 9) Assume that you are installing rough-in plumbing for an automatic clothes washer. The minimum size of the drain is required to be two inches in diameter. An indirect waste is required. It must be trapped and vented. The standpipe receptor that will receive the drainage from the washing machine must be a minimum of 18 inches tall. And, the standpipe is not allowed to be more than 36 inches tall. 10) Sewers and water services are not allowed to be installed in a common trench. A waste-and-overflow assembly that is connected with slip nuts and washers is required to be accessible. This is normally accomplished with the use of a removable access panel. When waste and overflows are connected with solid joints, such as solvent-weld joints, they are not required to be accessible. Lavatories are required to have drains that have a minimum diameter of 1.25 inches. Most fixtures can be replaced with new fixtures without the need for a permit as long as the new fixture is installed in the exact location of the fixture being replaced. And exception to this is a water heater. Any water heater replacement requires a plumbing permit and code inspection. Relief vents are required when trap arms exceed the maximum allowable distance between a vent and the trap that it is serving. The drainage from bathtubs, showers, lavatories, clothes washers and laundry trays can be collected to be used as recycled gray water. This recycled gray water can be used to flush toilet and urinals. It can also be used for landscape irrigation purposes. DWV systems can be tested with air or water. The testing must be maintained for a minimum of 15 minutes without losing test pressure. Testing must include both the drainage and venting systems. There are many types of backflow preventers. They include vacuum breakers, reduced-pressure-principal backflow preventer, and others. Air breaks are also used to prevent backflow. But, an air gap is the most positive form of backflow protection. Island vents are only allowed for installation on sinks and lavatories. Water services can be installed in a common trench with a sewer under certain circumstances. Normally a shelf is made along the side of the trench to house the water service. The bottom of the water service pipe must be at least 12 inches above the sewer pipe in this type of arrangement. Another option is for the two pipes to be installed at the same level in the bed of the trench. When this is the case there must be a minimum of five feet of either undisturbed or compacted dirt separating the two. The only other method is to sleeve the water service so that the sleeve extends at least five feet on each side of the sewer that a water service is crossing horizontally. 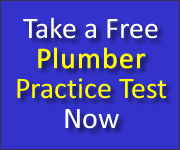 For more practice, take our interactive Free Plumbing Practice Test.